Salt River Stories is a free mobile app that puts the history of the Phoenix-Scottsdale-Mesa-Tempe metro area at your fingertips. 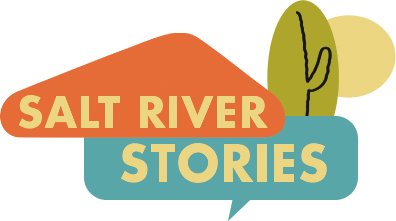 Salt River Stories lets you explore the people, places, and moments that have shaped the region’s history. Learn about the region through layered, map-based, multimedia presentations, use social media to share your stories, and experience curated historical tours of the desert metropolis. The Salt River defines the valley in which Phoenix and the broader suburban metropolis emerged during the 20th century. The Salt River is both a watershed and valley--in which gravity forces water to flow from the Granite Reef to the East into the Valley nurturing human development in the region. First the Hohokam settled in the region setting up a system of canals, and later in the 19th century, another wave of settlers rediscovered the canals of the Hohokam and created a new hydrological infrastructure that would transform the desert from an arid desert into an agricultural center and later a tourist mecca. Over the course of the 20th century, water and human settlement would continue to transform the region, creating one of the largest metropolitan regions in the United State. We chose to call this historical project Salt River Stories to highlight the amazing ways that environment and human society have shaped the Valley of the Sun. Salt River Stories emerged at the intersection of two projects. In 2010, the Papago Salado Association began work on audio stories that would allow tourists to the region to experience Scottsdale and Papago Park's cultural institutions. The "Story Tour" project involved a variety of partners who collaboratively identified historic sites and an approach to introducing those important regional treasures to public audiences, especially tourists, though audio narratives. After conducting research and producing stories, Papago Salado Association worked with Scottsdale Public Television and Arizona State University to record 45 audio narratives about the region. Papago Salado Association began to explore ways to share those stories in easy-to-use mobile formats in 2012 and 2013 through its continued partnership with Arizona State University. In 2013, the project turned to using Curatescape as that platform, and came under the direction of Professor Mark Tebeau at Arizona State University. Presently, ASU undergraduates and graduates develop stories, often in collaboration with the broader community. The project is built using Curatescape, a mobile framework for the Omeka archival content management system. Curatescape was created by Professor Mark Tebeau & Cleveland State University's Center for Public History + Digital Humanities. The project advocates an approach to place interpretation based within local communities. This project would not have been possible without the support of the School for Historical, Religious, and Philosophical Studies, the College of Liberal Arts & Sciences, and the National Endowment for the Humanities. Unless otherwise noted, the oral history audio used in this project was collected by students at Arizona State University. Most photographs (as well as other digital objects) on the Salt River Stories website and mobile apps are drawn from public archives and/or the Internet. Sources are cited in the captions for each image (and/or digital object.) For further information about photographs, including requests for reproductions, contact the listed source directly. We support an open internet and endorse the approach embodied in the Creative Commons. If you have questions about any images and/or if one of our team members inadvertently violated copyright on an image, please contact us immediately. Stories and materials produced by Salt River Stories authors and content creators is available for use through a Creative Commons non-commercial, attribution, share-alike license. Appropriate citation information is listed at the end of each story. Direct all questions and comments to Dr. Mark Tebeau, Arizona State University, (480)-965-8595 or via email: mtebeau at asu dot edu.